In the heart of the spacious and fertile the valley of Leskovac, fifty kilometres long and forty five kilometres wide, lies the city of Leskovac. It abounds in a great variety of geographic features and tourist facilities which will attract even the most particular of visitors. 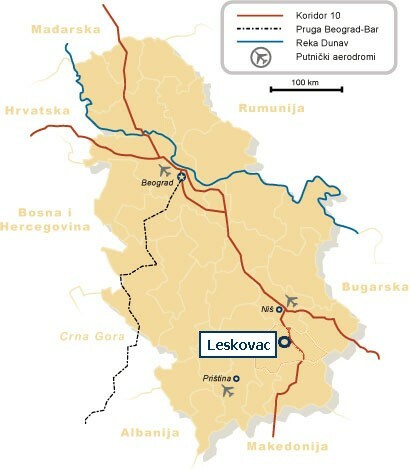 Apart from this multitude of features and facilities, Leskovac is also an important transit centre, providing links to Southern Europe (Greece), North-Western Europe via Belgrade, the Adriatic Sea via Priština, and the Black Sea and the Euro-Asian corridor via Sophia. 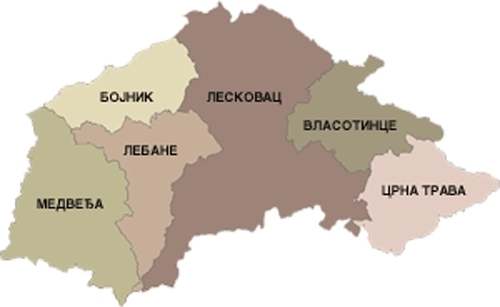 The territory of the municipality of Leskovac is situated at an altitude between 210 and 240 meters above sea level, and lies in a fertile valley bordered by the Babić mountain range (1098m alt. ), Mt. Seličevica (903m alt.) and Suva (Dry) Mountain to the east, Mt. Radan (1409m alt.) and Mt. Pasjača to the west, and Mt. Kukavica (Coward) (1442m alt.) and Mt. Čemernik (1638m alt.) to the south. It opens out towards the Valley of Niš to the north, and through the Gorge of Grdelica towards Vranje-Bujanovac Valley to the south. Because it is characterized by a moderate continental climate with very mild winters and moderately warm summers, the region of Leskovac abounds in scenery which is exceptional in its diversity and beauty. Numerous mountains, lakes, rivers, natural springs, canyons, gorges...are all distinctions of this region. The average annual temperature is eleven degrees Celsius, and the average air humidity is 64% in summer, and 84% in winter. The average annual rainfall is 600 mm per square meter. Leskovac is a city in which there are on average 160 days annually without wind. It is in the Middle European Time Zone with the usual summer and winter daylight saving adjustments. Leskovac is a modern city of today, the center of Jablanica district, and the municipality of Leskovac has 144 settlements with more than 160,000 inhabitants. Leskovac is a traffic junction, the railway line was introduced in 1886 (while the railway was being built by Svetozar Masin, an engineer, his wife Draga Masin, the future queen of Serbia and the wife of Alexander, the last king from Obrenovic dynasty was temporary living in Leskovac. The railway is international, therefore trains travel to Vranje, Skopje, Thessaloniki, Athens. Through the valley of Leskovac the most important is the E-75 road which connects Western and Northern Europe with Southern Europe and Near East. There are also regional roads that lead to Pristina, Pirot and Bosilegrad. The distance from Leskovac to the nearest Nis is 45 kilometres, 280 km to Belgrade, 161 km to Sofia, 166 km to Skopje, 804 km to Athens. In the immediate surroundings of the city there is the airport 'Mira' and in the vicinity of the runway there is a hippodrome.